Dinosaur State Park officially opened in 1968, two years after 2,000 dinosaur tracks were accidentally uncovered during excavation for a new state building. More than five hundred of the tracks are now enclosed within the Exhibit Center's geodesic dome.The remaining 1,500 are buried for preservation. On August 23,1966, fossil tracks were uncovered during excavation for a state building. When Edward McCarthy turned over a slab of gray sandstone with his bulldozer, he saw a large footprint with three toes. The news of the discover spread quickly as more tracks were uncovered. Within a few weeks, officials decided to preserve the site as a state park. As a result of careful excavation, the park has one of the largest on-site displays of dinosaur tracks in the entire world. 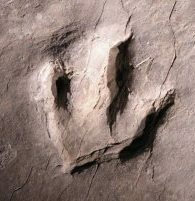 Why are Names of Tracks and Dinosaurs Different? Fossil tracks are classified and named independently from fossil animals. Dinosaur State Park's tracks are named Eubrontes. One of America's first geologists, Edward Hitchcock, invented that name and many others in his pioneering studies of Connecticut Valley tracks. No remains of the dinosaur that made Eubrontes have been found in the Valley. However, most scientists agree that the trackmaker was a carnivorous dinosaur similar in size and shape to Dilophosaurus. The tracks range from 10 to 16 inches in length and are spaced 3.5 to 4.5 feet apart. Eubrontes is the official Connecticut State Fossil. A smaller track, given the name Anchisauripus, is also present. These tracks may have been produced by younger individuals of the Eubrontes track maker, or by a smaller relative. Rock slabs bearing other Connecticut Valley fossil tracks are also displayed in the Exhibit Center. Among them are the large four-toed Otozoum tracks with clearly visible skin impressions. Some of these tracks were uncovered in the brownstone quarries at Portland, CT.
On a sunny day in August 2006, just off West Street, an excavator tore through the bedrock of gray sandstone. On the overturned rock, he saw several three-toed dinosaur tracks. Fortunately, he understood their value and notified the site's general contractor. Does of all of this sound familiar? This account is nearly identical to what took place during the discovery of tracks in 1966. However, this happened within a week of August 23, the Park's 40th anniversary! The construction site, which will be a new health care facility, lies on the grounds of the State Veterans Home, located across the street from the Park.